The Professional Development for Arts Educators grant is a natural extension of the College of Visual and Performing Arts' community-engaged work with local schools. 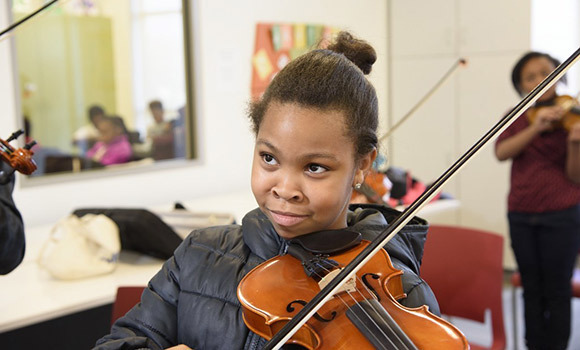 In the photo above, a student learns violin as part of the Arts After School initiative. UNCG is currently in the process of developing coursework. Implementation will begin in the summer of 2018. GCS was the only school system in North Carolina to receive the Professional Development for Arts Educators grant. Just 20 grants in 14 states were awarded. To learn more about the College of Visual and Performing Arts, visit vpa.uncg.edu.